Today is the first day of my last week of this food stamp experiment and, interestingly, I have more food left than I can possibly eat. I will have to replenish my banana supply, but with one banana left I will only need to buy five and, at 19 cents each, that is less than a dollar. Just quickly taking stock, I have two frozen meals of pea soup, probably two of chili, one steak, one chicken leg and thigh, another package or two of pork, and that fairly good sized roast that I will cook tomorrow. 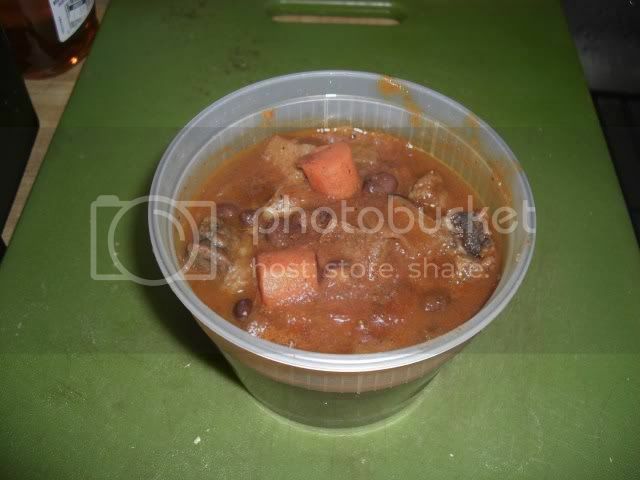 I also have at least half a dozen eggs, eight packages of oatmeal (two make a serving) half a loaf of bread, three quarters of a jar of peanut butter, more rice than I could eat in another month, half a package of spaghetti, lot's of beans, six oranges, a can of crushed tomatoes and a can of tomato puree. 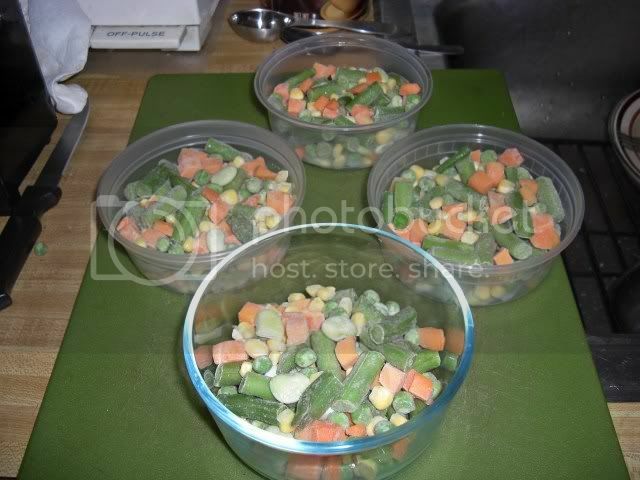 Also another six servings of mixed vegetables. Oh yeah, another package of frozen spinach, almost half a bag of broccoli, and a fair number of increasingly hairy and flexible carrots. And that is after what today's meals. As I am sure you have noticed, I haven't exactly been starving myself, and today was no exception. You may recall that I had a decent-sized piece of steak left over from last night's dinner, so I had that with breakfast. 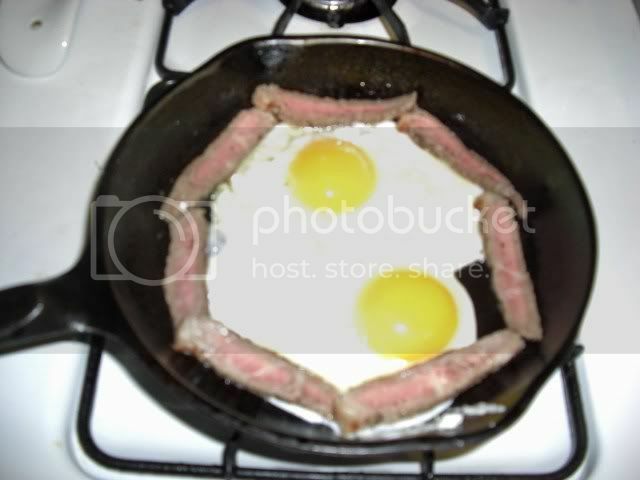 I didn't do anything too fancy, just sliced the steak fairly thin and then put it into a frying pan with a bit of olive oil and a couple of eggs. Next I used a trick my dad taught me. 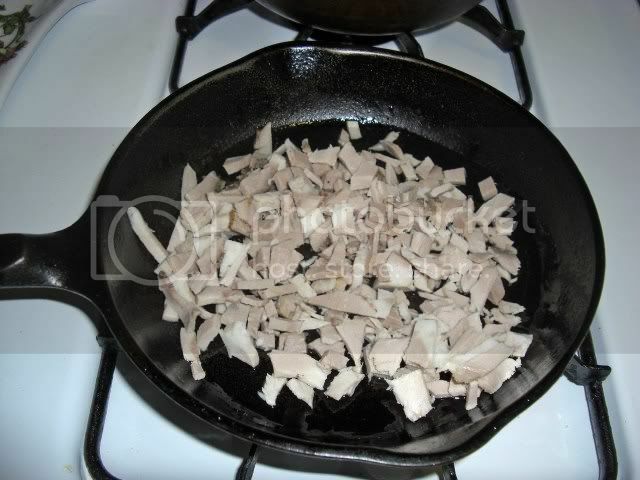 Throw in a little water and then put a cover over the pan. 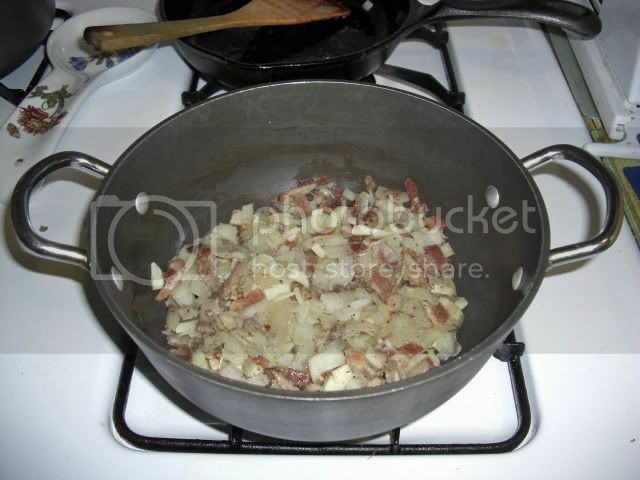 This steams the eggs and cooks the top so you don't have to flip them. You just want to cook them until the tops of the yolks turn pink. 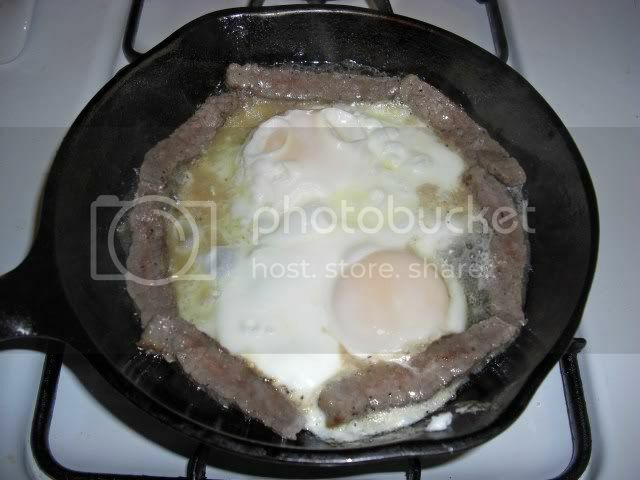 This is easy if you have glass cover for the pan. Trickier if you don't, and I don't. 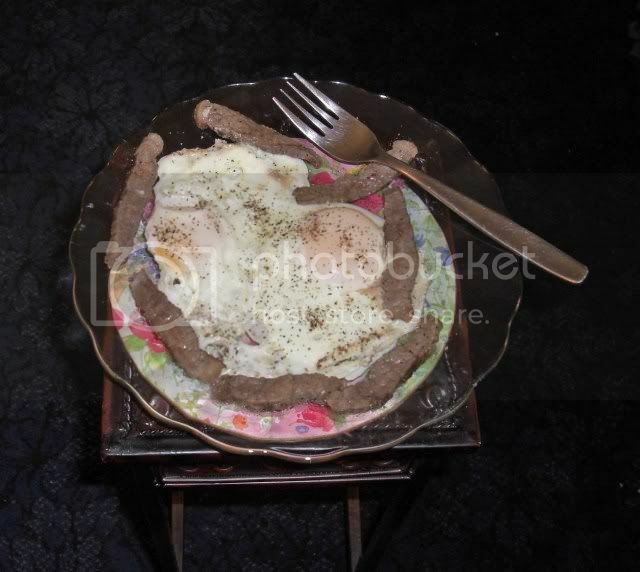 Dished up with some salt and pepper on the eggs and you have a breakfast fit for a king. 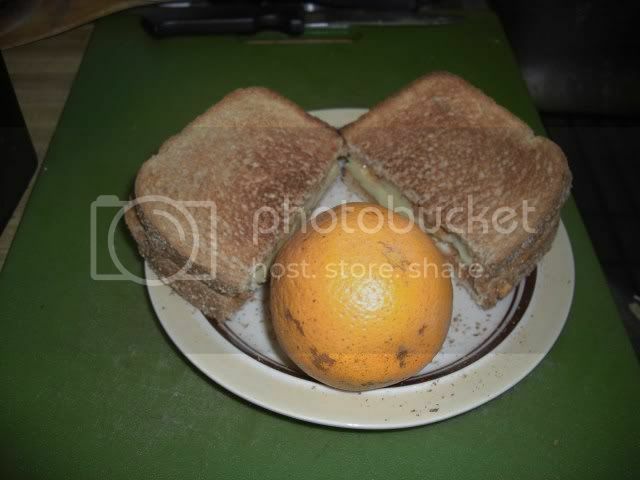 Just the standard peanut butter and banana sandwich for lunch with an orange thrown in to get my vitamin C.
I had one frozen package of pork thawing in the refrigerator and I had to decide what to do with it. 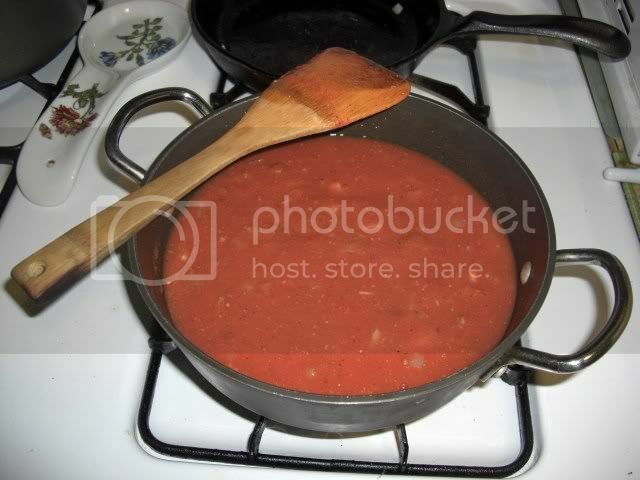 Pork with rice and beans didn't really float my boat so I decided to make spaghetti sauce with it. 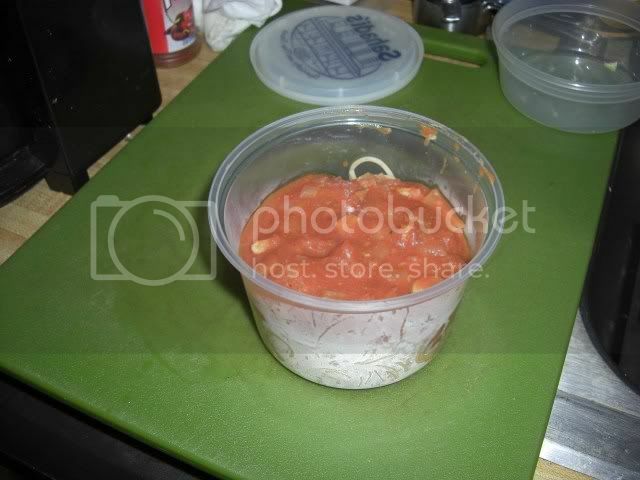 I wanted this to be kind of like a meat sauce, but not have big chunks of meat in it. 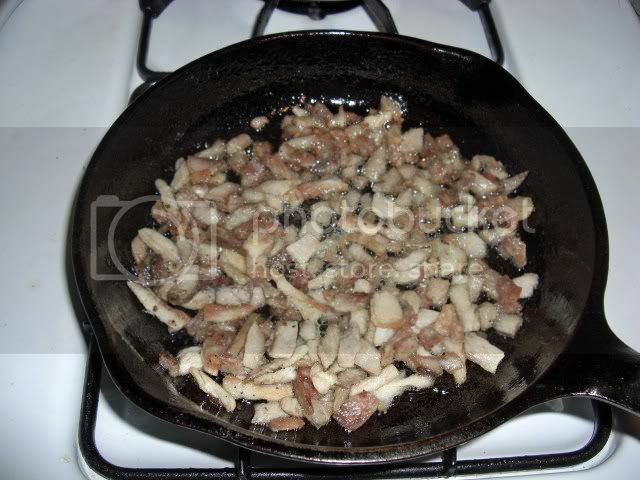 First step was to fry up the pork in a little olive oil. And please, no Popeye jokes about putting the pork into Olive Oyl. As an aside, Shelley Duvall is one of my favorite actresses. Oh, and another bit of Popeye, or Betty Boop, related trivia. Did you know that Betty Boop and Popeye appeared together in a 1933 cartoon? Betty Boop is a hula dancer at a carnival sideshow. Olive Oyl and Brutus are in it as well. Not that this has anything to do with anything. Bar Man's mind wanders a bit at times. 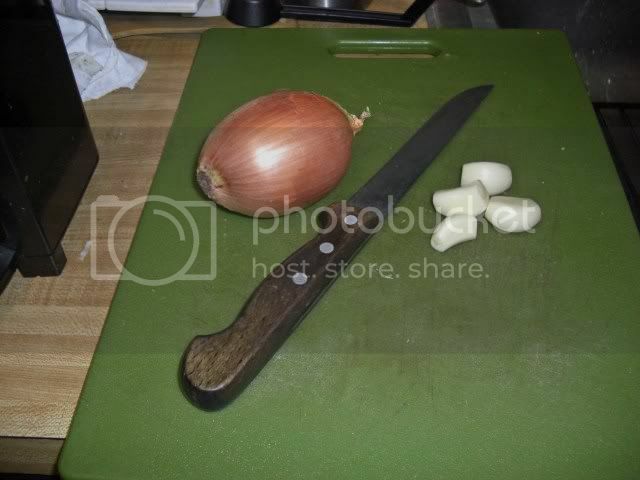 Of course, I had to add my two favorite ingredients, onion and garlic. 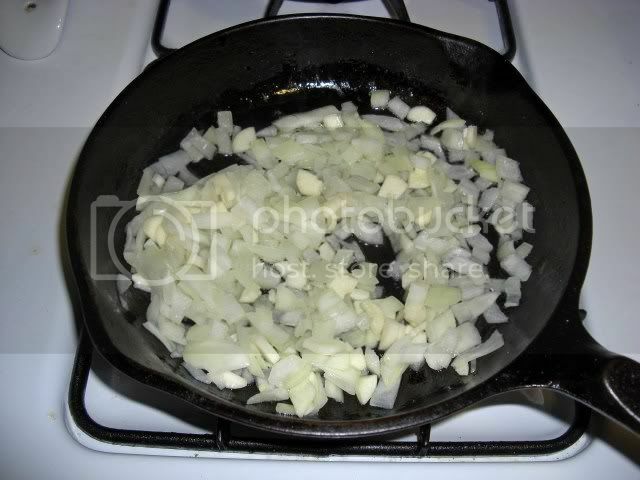 And, after the pork was nice and crispy I threw in the onion and garlic, turned the flame down low and let it simmer until everything was translucent. Well, everything except the pork. Time to open another can of chopped tomatoes. 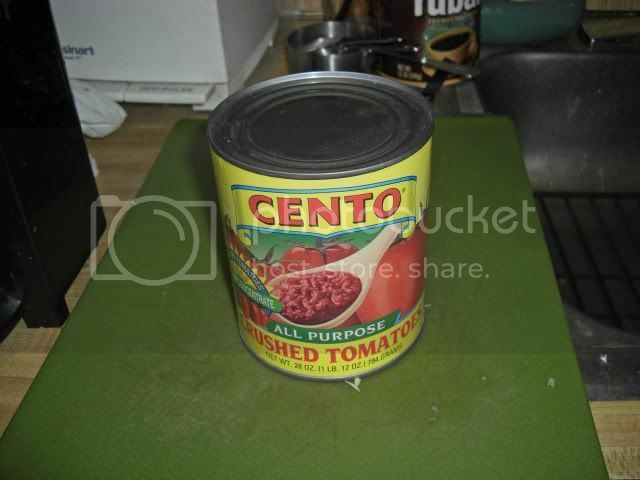 Cento means hundred in Italian, but I am sure there aren't a hundred tomatoes in here. What Does The Cento Mean? 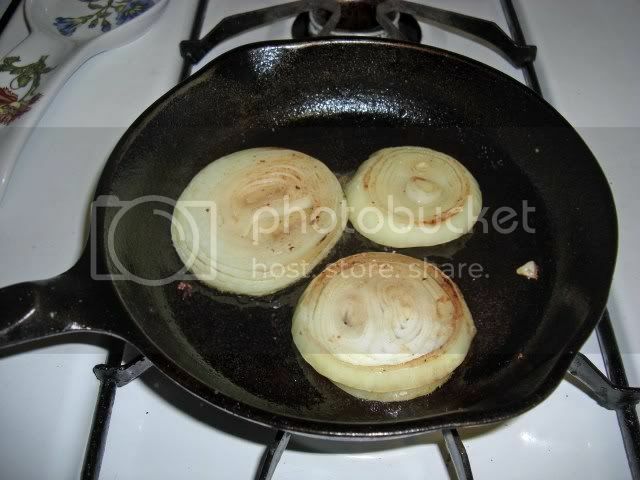 After the onions and garlic were done I moved them from the frying pan into a pot. 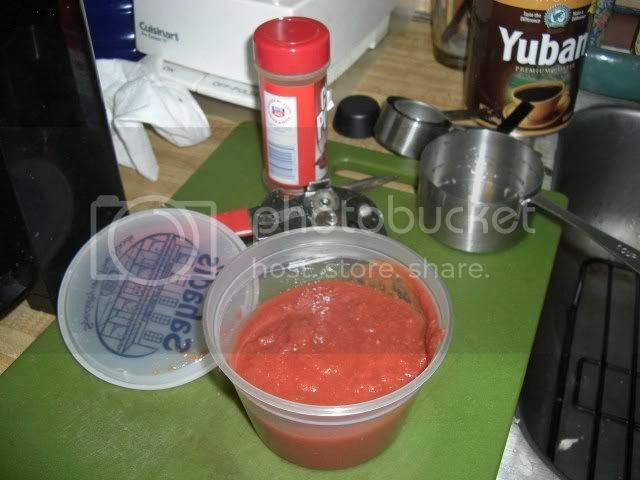 Then I added the crushed tomatoes and a heaping tablespoon of mustard to give it some kick and a healthy dollop of chili powder, plus some salt. 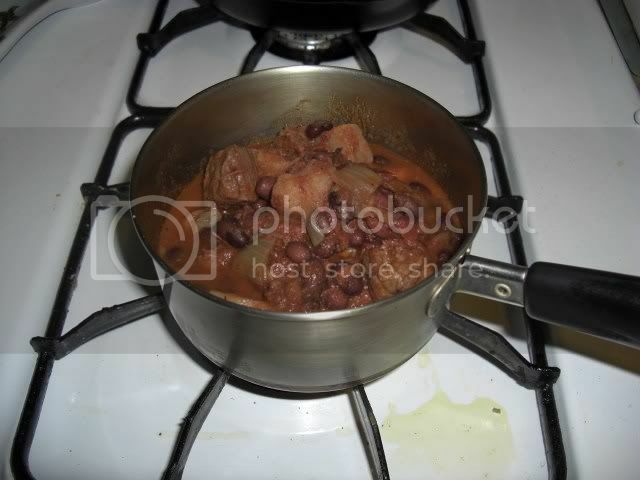 I added a cup of water to thin it out a bit and then just let the whole thing simmer for about half an hour. While it was simmering away I broke out a serving of mixed vegetables and plunked them into a little pot to simmer for about ten minutes while I made some pasta. When everything was ready I put it on a plate and had a very filling dinner. I had more spaghetti than I could eat so I put some of it away and will have it for lunch tomorrow. 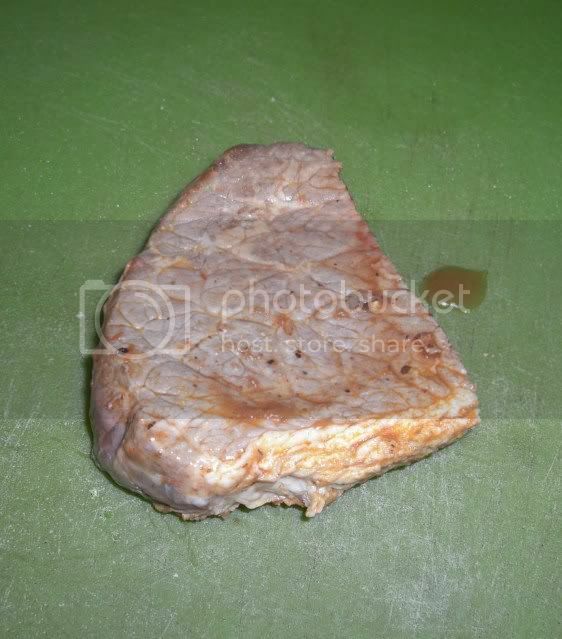 I just want a small lunch because I will probably have a good-sized dinner when the roast is done. At least I will have a good sized helping of meat. 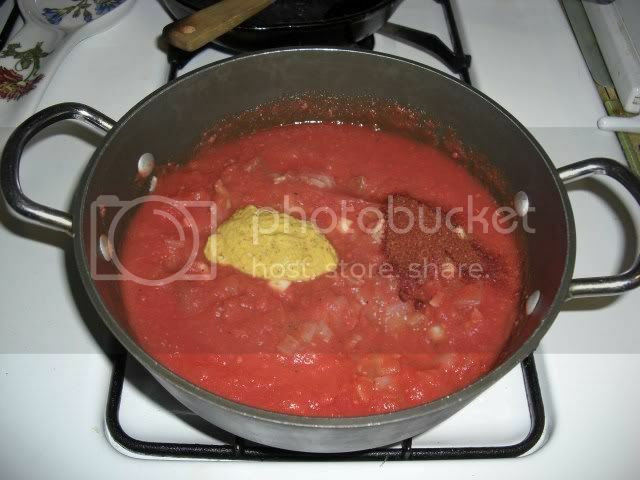 And, I had enough spaghetti sauce left to use for something. 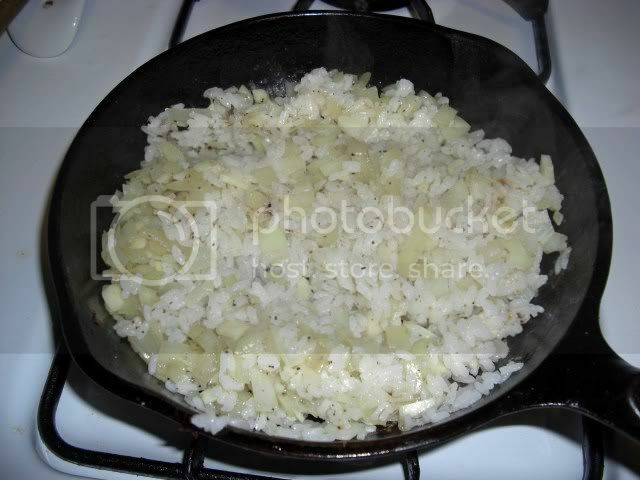 Maybe an egg dish or over rice. 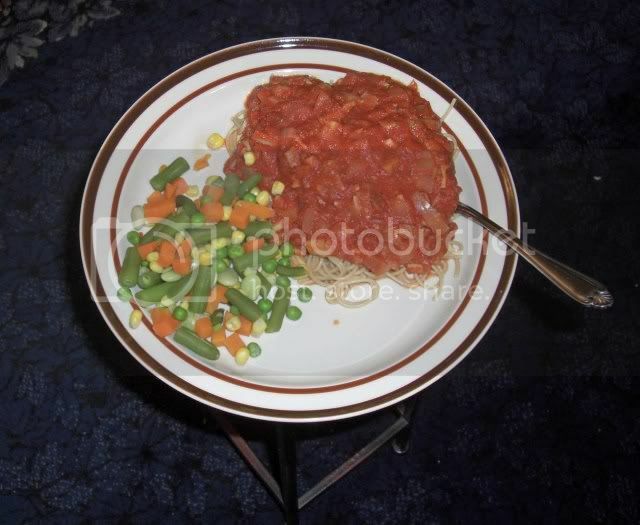 Can't just put it over spaghetti, that would be too predictable. I watched the movie 'Saving Grace' tonight and it was pretty funny. There was one part that bothered me because it wasn't realistic. Not that the rest of the film was either. Anyway, at one point two elderly ladies stumble into Grace's greenhouse where she is growing marijuana. They are told it is tea so one of the ladies takes a few of the leaves, not even the buds, and makes tea out of it, brewing it just like you would brew a regular pot of tea. They then get totally wasted and are still buzzed and laughing the next day. I just don't think that would happen. But, it is a pretty funny movie, and I recommend it. I got it from Netflix. 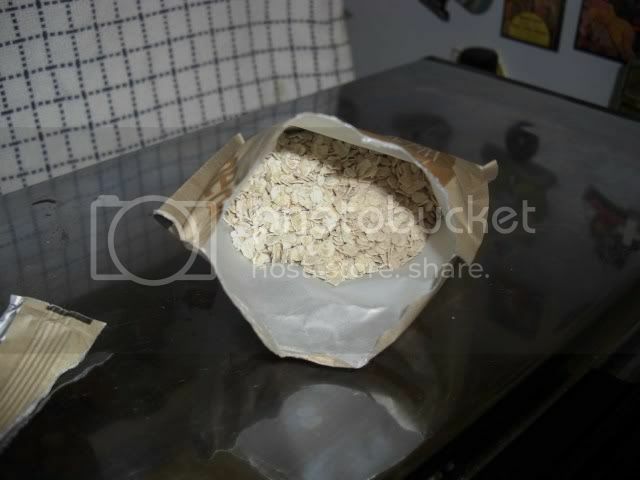 I had a little bit of my regular instant oatmeal left and to augment the "single serving" sized portions of my variety pack I thought I would throw it in. I was going to have chili and eggs for lunch so I had to get my banana fix in with my breakfast. 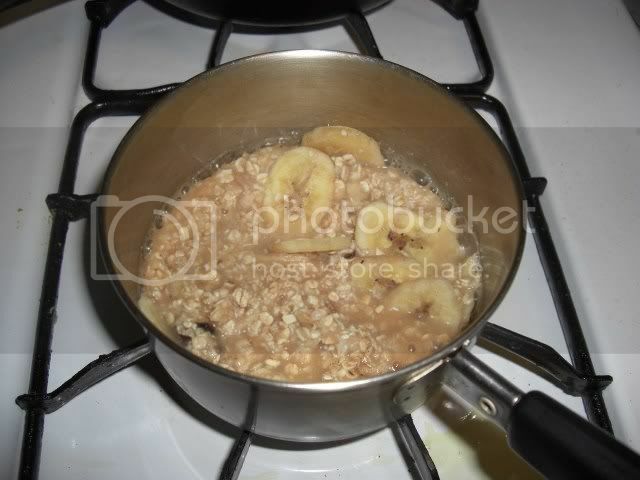 This means making my oatmeal a little looser than normal by adding a bit of milk. Lunch was kind of a late TexMex style breakfast, and I ate it a bit early too. I just scrambled up the two eggs. 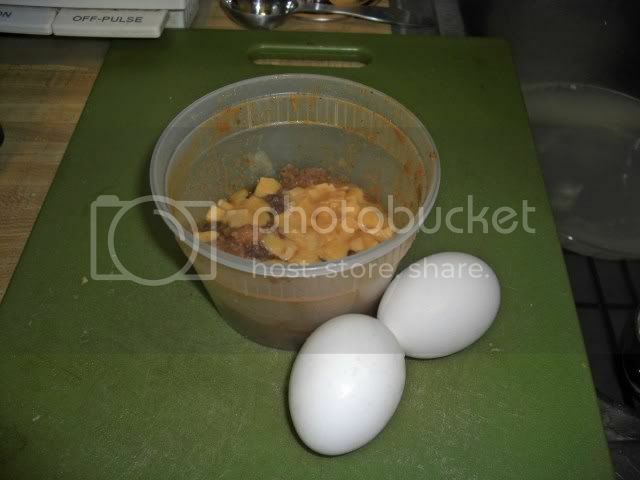 Then after putting the chili and cheese in the microwave for about a minute and a half I dumped it over the eggs and had my lunch, or brunch. Tonight was steak night but first I had to do some portioning. 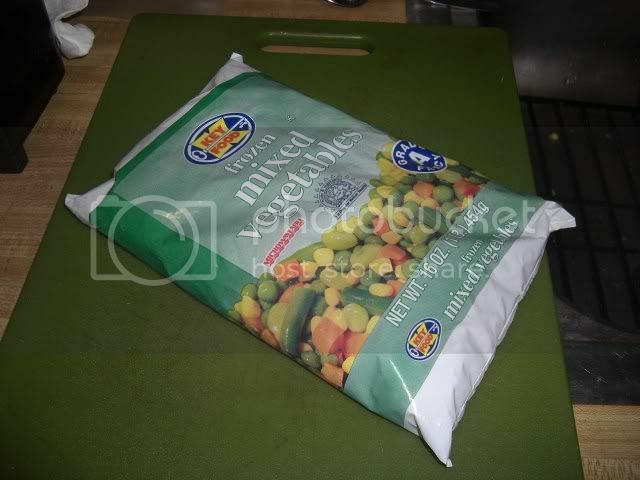 There were four cups of mixed vegetables in the bag of frozen vegetables and I figured one cup was a good-sized serving. Three went into the freezer for future meals and one went into a pot where it simmered for awhile. 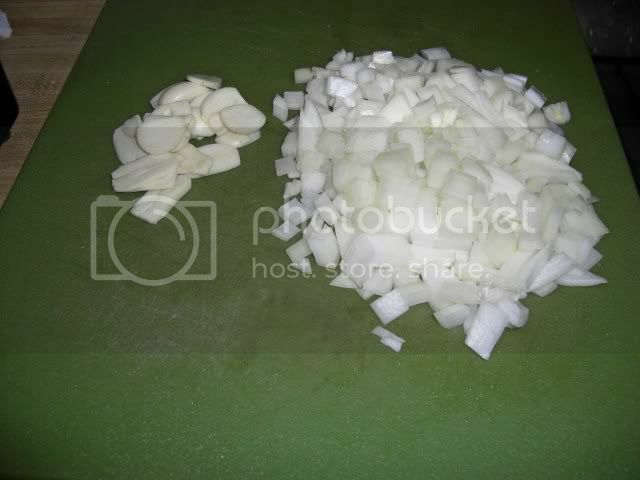 Before frying the steak I first fried up some onion and garlic which I set aside. 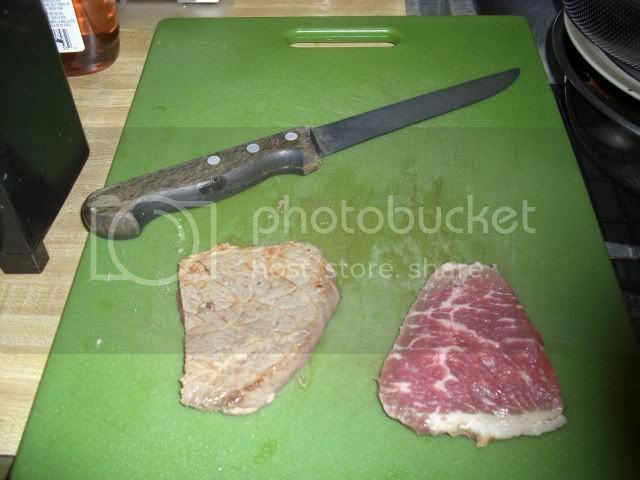 It flavors the oil a bit for the steak, though. While everything was going on I also had some rice cooking up. 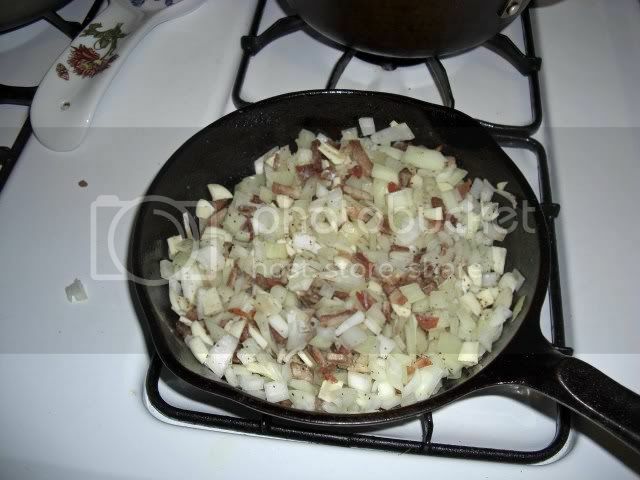 When it was done I put it into the frying pan, after removing the steak, and stirred in the onion and garlic. 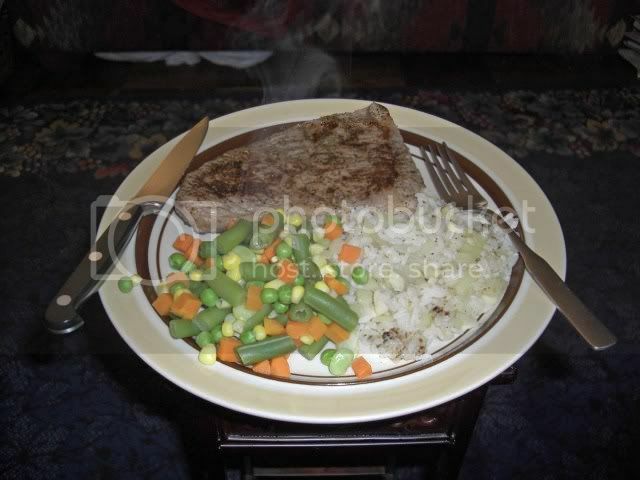 And when everything was said and done I had a hearty and healthy meal. Well, I would call it healthy. 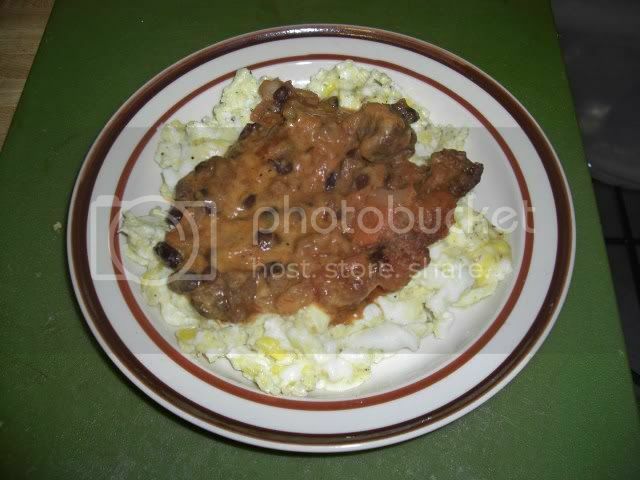 I am sure there are some who would take exception to the fried steak. But I am the Bar Man and Bar Man drinks beer and bourbon and eats steak. No beer and bourbon for another week though. 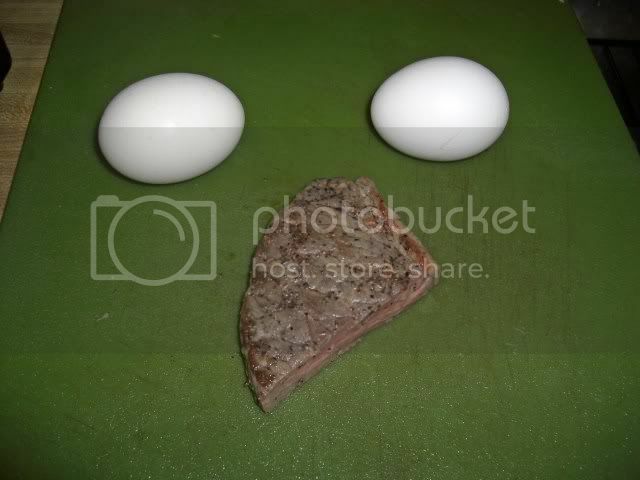 Once again I had more steak than I could eat so I set what was left aside and will have it with eggs for breakfast tomorrow. And that, my friends, was my Friday. Confronted by decisions first thing in the morning. What a horrible way to start the day, almost like having to go to work. I decided to go for the Cinnamon 'n Spice, it just sounded so cheerful. 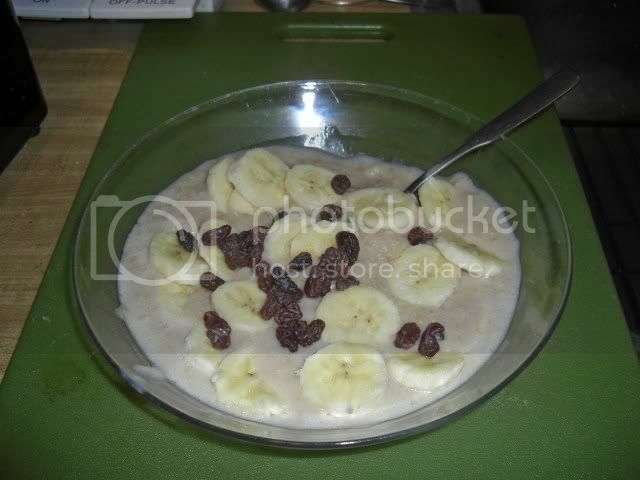 I did decide to jazz it up a bit with a few raisins and some dried bananas. I was a bit concerned that what they call a serving would be on the small size. And, I was right. the portions are on the small size. 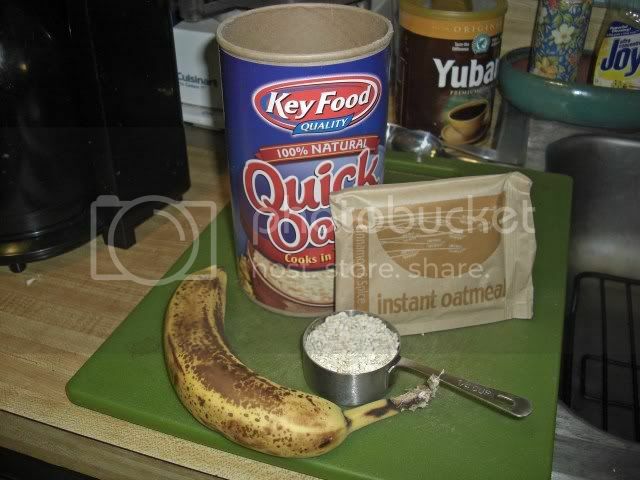 The next one I make I will add the remaining oatmeal that I had and then use two packages going forward. 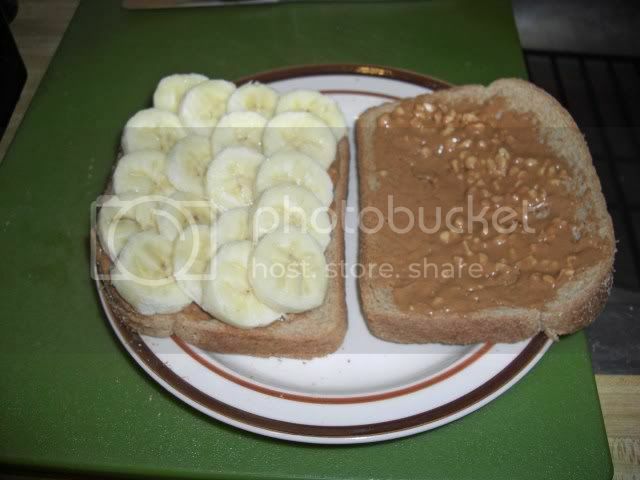 I had my fairly usual peanut butter and banana sandwich for lunch, and this time I remembered to take a picture. 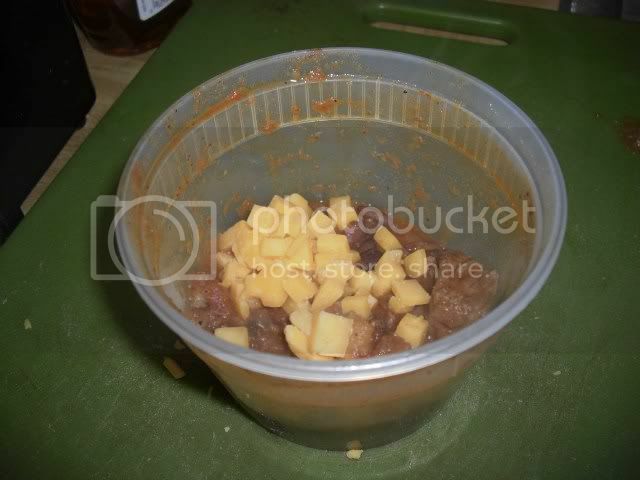 For supper I broke out a container of leftover chili. 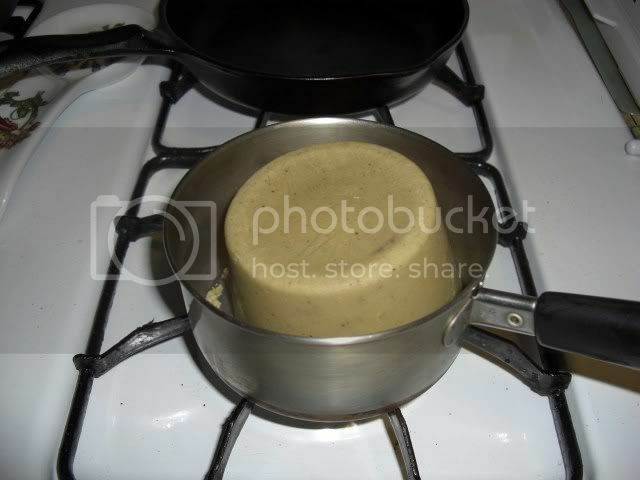 No microwave though, I just heated in my all purpose little pot over a low heat. It had thawed out in the refrigerator overnight. I remembered the last bit of cheese that I had left from the two packages I bought and figured this would be a good time to use it up. 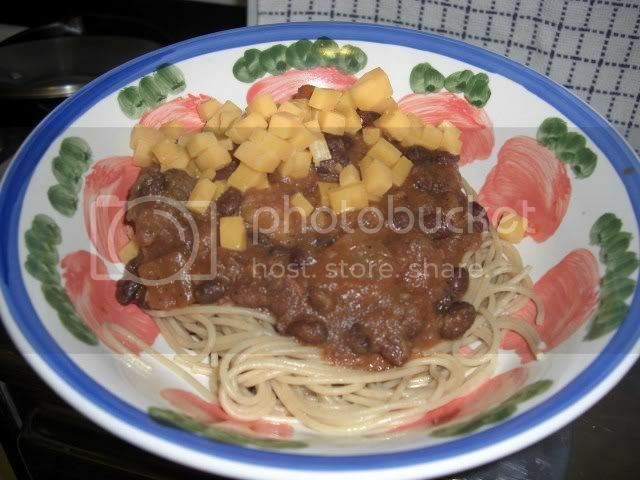 In a burst of inspiration I decided to have the chili over spaghetti. This is known as Cincinnati-style chili and, for some reason, is quite popular in, you will never guess, Cincinnati. 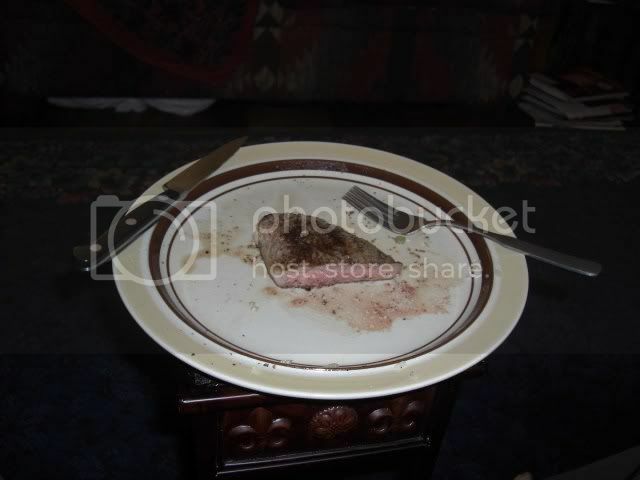 It is the signature dish at the Skyline Restaurant. which was founded in 1912 by a Greek immigrant, Nicholas Lambrinides. When all was said and done I had plenty to eat and squirreled away a bit of the chili and cheese to use in am omelet tomorrow, either for breakfast or lunch. I haven't quite decided yet. 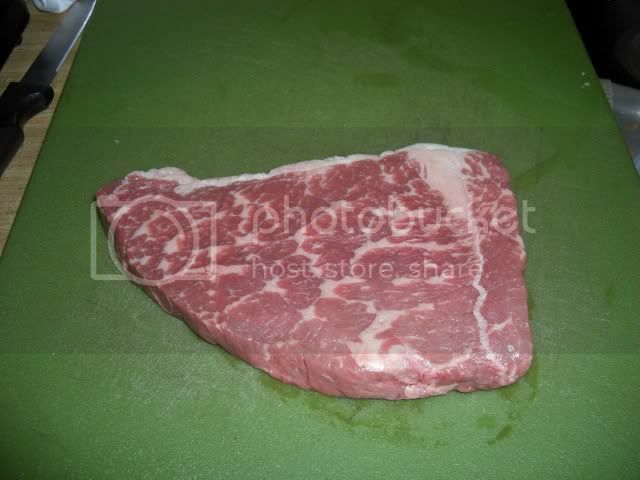 I took another "steak" out of the freezer and plan on having that with some of my frozen vegetables for dinner tomorrow. My Friday nights are just so exciting these days. Well, after tomorrow I will only have one left to go. 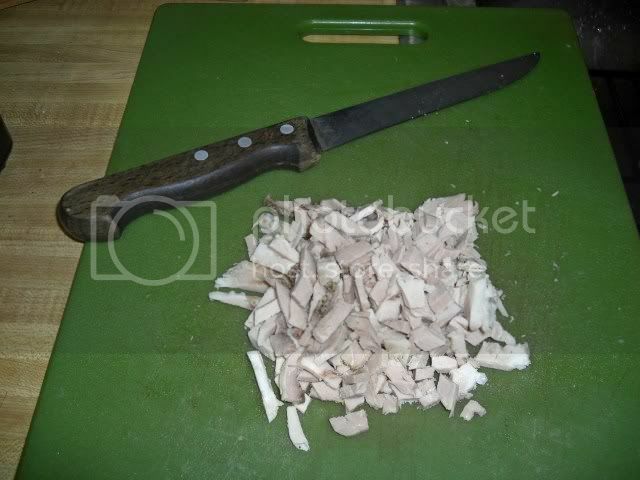 It isn't the lack of food, or even the variety that I miss with this diet. Quite frankly, it is going out to eat on occasion and having a cocktail or two and some wine with my meal. But, I had to do this to satisfy my curiosity. It is a bit of a departure from hitting three or four bars every day, though. And a lot cheaper. Another trip to Key Food today, and probably my last. I think I will only need to buy more bananas to get me through the end of my month. 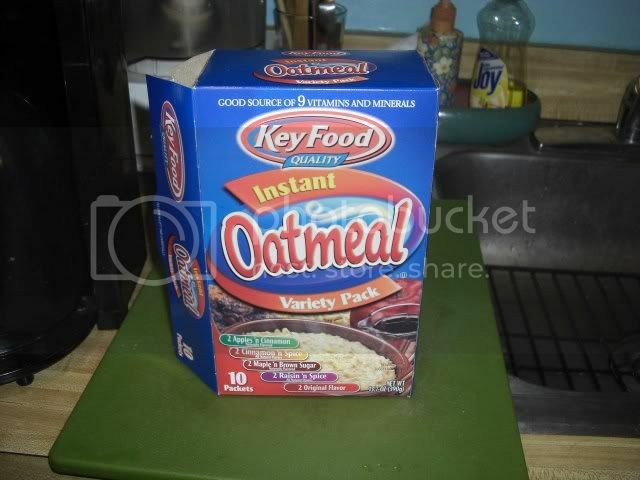 Today I bought an Oatmeal Variety Ten Pack for $1.99. 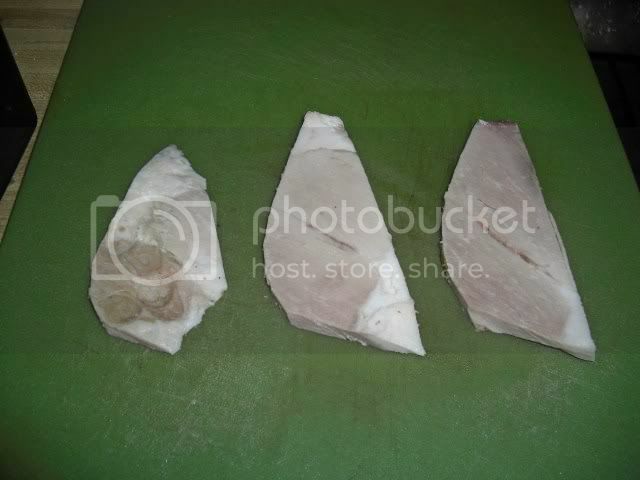 The individual portions look a bit on the skimpy side, but I will try one tomorrow and see. 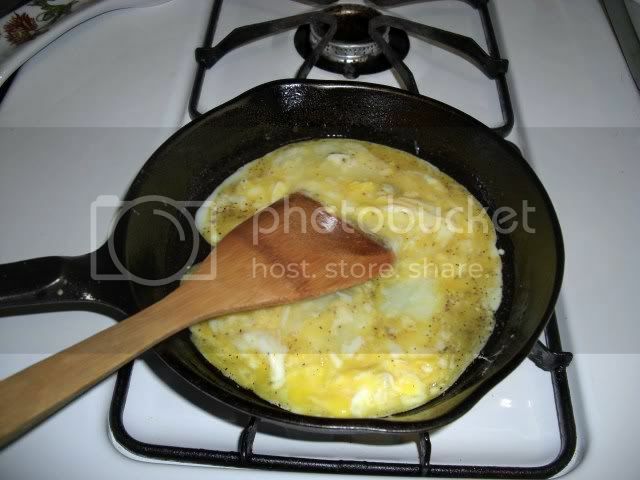 No problem though because I still have plenty of eggs, and omelets for breakfast are always good. I also bought a bag of onions for $1.99 and two 1 pound bags of frozen mixed vegetables for $3.98. And $1.49 worth of dried bananas. They were $1.99 a pound so I guess I bought a little bit less than that. That was $9.45 for the day and a grand total to date of $137.80. I figure I should end up under $140 for the month. 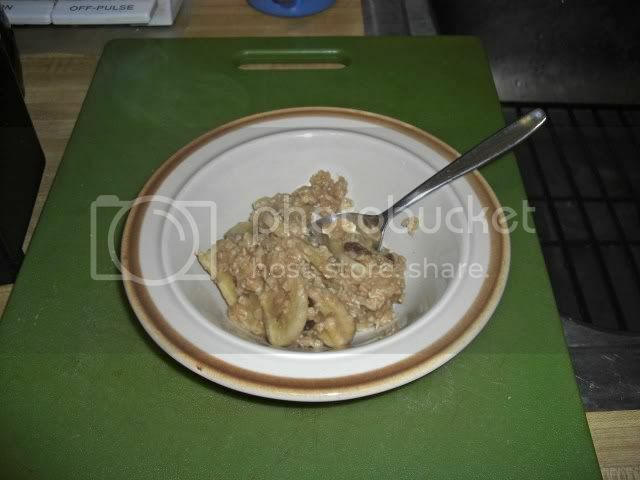 This morning I ate breakfast before I went shopping so I had a real banana in my oatmeal again. I took a picture of it but my card was still in my card reader. 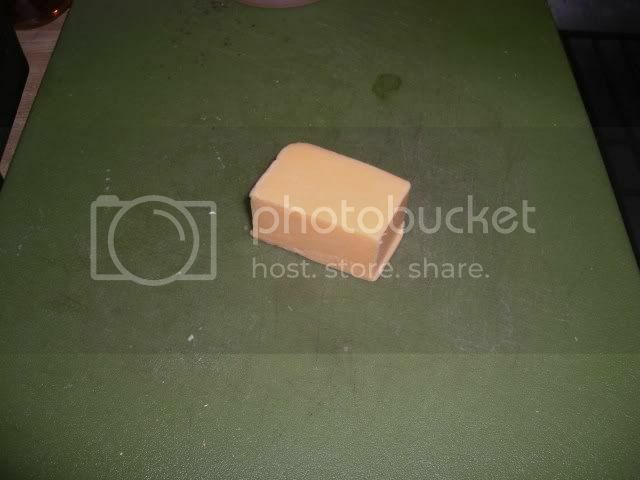 The camera just used internal memory and I didn't see any message. Now I don't know how to get it off to put on my blog. You will just have to use your imagination or scroll back a few days to see what it looked like. 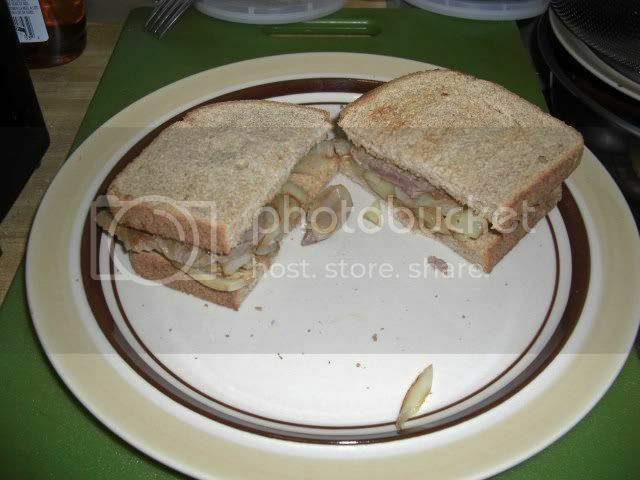 For lunch I did make a sandwich out of the leftover steak from last night. 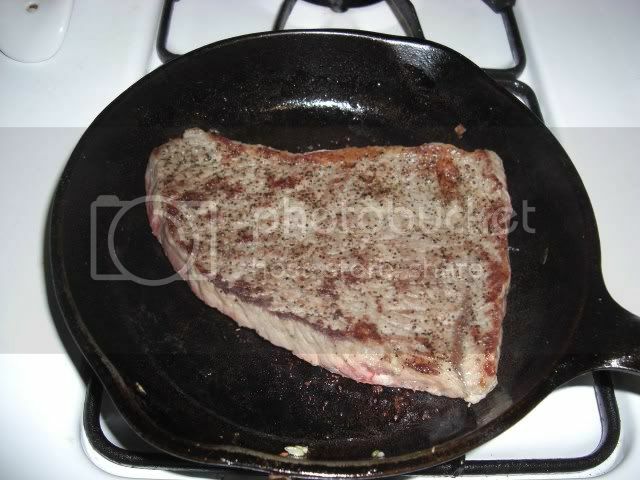 The reason I had a good chunk left over was because it was a pretty thick steak. Too thick for a sandwich, so I cut it in half. 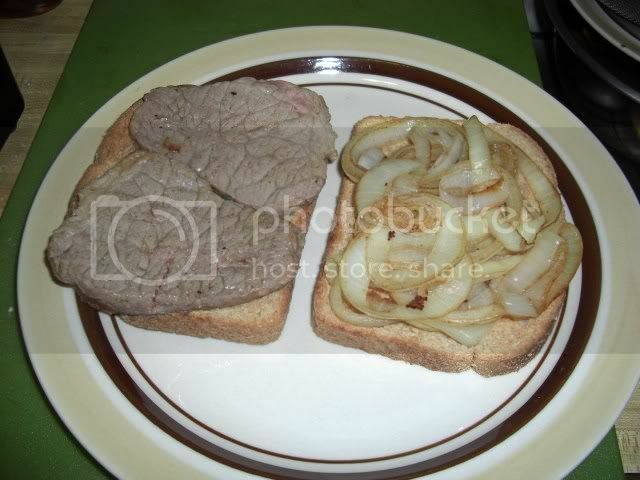 I sliced up half an onion and fried it up so I could have a steak and onion sandwich. 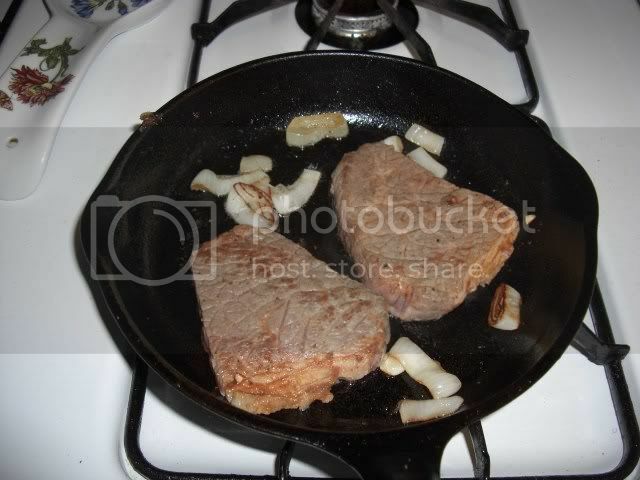 Then, after the onions were fried, I put the steak, rare side down, into the frying pan for a quick sizzle. It was a very good sandwich indeed, if I do say so myself. Kind of reminded me of Warren Zevon. Check out 'Enjoy Every Sandwich' for a good album of various artists covering his songs, everyone from Bob Dylan to Bruce Springsteen. 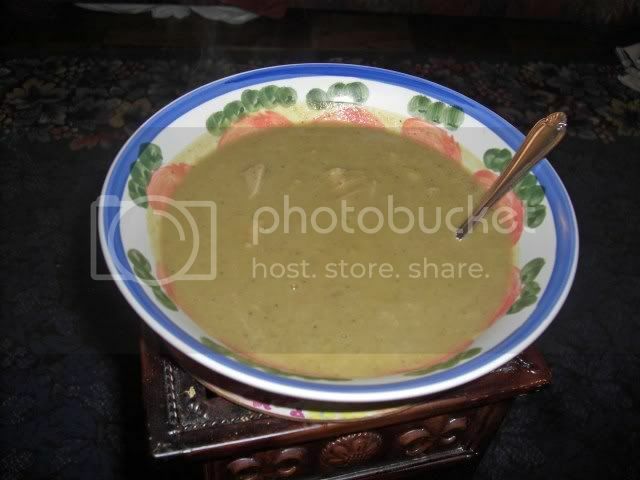 I just warmed up some of my leftover pea soup for dinner. I ended up with a nice bowl of soup that was more than enough after my hearty lunch. I also ate my last grapefruit today so now it will be on to my oranges. It is supposed to be another chilly and cloudy day tomorrow so I think it will be a good day for chili. The prediction is for sun and temperatures to hit 80 on the weekend though. That would be nice, it has been a chilly and wet spring so far.